Aung San Suu Kyi and the NLD win big in Myanmar elections. Aung San Suu Kyi Wins Big in Historic Myanmar Election. Can She Fulfill Her Promise? Myanmar opposition leader and head of the National League for Democracy (NLD) Aung San Suu Kyi leaves a polling station after casting her vote in Yangon on November 8, 2015. Myanmar’s voters have spoken: The party headed by longtime opposition leader and international icon Aung San Suu Kyi appears to have won a landslide victory in yesterday’s election. But the extent to which she’ll actually be allowed to lead the country is still uncertain. Final results won’t be declared for a few days, but all 12 of the seats announced so far have been won by Suu Kyi’s National League for Democracy, and the chairman of the ruling Union Solidarity and Development party conceded, “we lost.” The result is all the more remarkable given widespread reports of fraud, discriminatory voting laws, disenfranchisement, and biased official media coverage in favor of the ruling party. The country’s military leaders traded in their uniforms for suits in the transition to nominally civilian rule in 2011, but ex-military figures including current President Thein Sein still dominate politics in Myanmar, also known as Burma, and they’re unlikely to give up power easily, despite the devastating rebuke from voters. The NLD predicts it has won more than 70 percent of the vote based on its own polling. Myanmar’s constitution reserves a quarter of the seats in parliament for unelected members of the military, but the electoral landslide may give the NLD just enough support to form Myanmar’s first democratically-elected government since the early 1960s. That short-lived government was ended by a 1962 coup that ushered in decades of stifling authoritarian rule by the military. The NLD actually won an election in 1990, but the results were ignored by the junta. 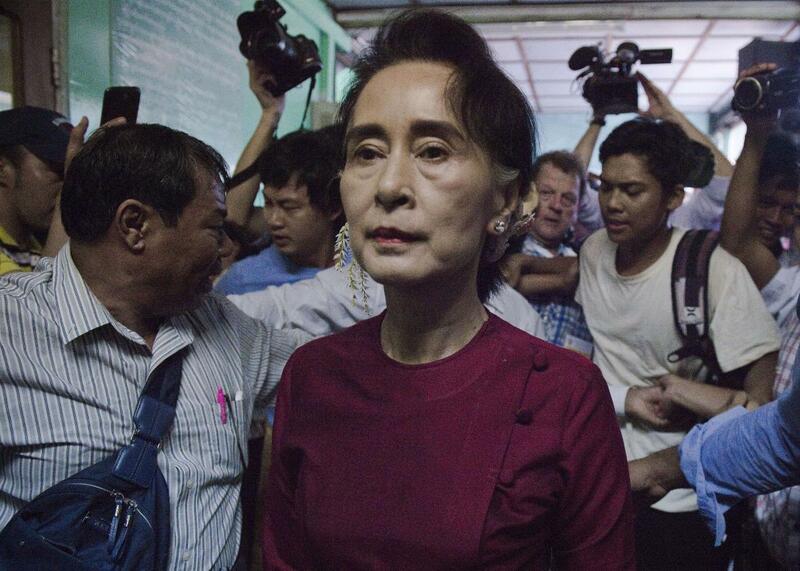 Suu Kyi, the 1991 Nobel Peace Prize winner, would spend 15 of the next 20 years under house arrest. Given that experience, as Phil Robertson of Human Rights Watch notes, it feels a bit early to celebrate. If the election does bring meaningful change to Myanmar, it would also be welcome news for Barack Obama and Hillary Clinton, who have touted Myanmar as a rare human rights success story to come out of their foreign policy agenda. Myanmar’s government was granted sanctions relief by the administration in 2012 in exchange for allowing the by-elections that brought Suu Kyi into parliament for the first time as well as releasing political prisoners and submitting to nuclear inspections. Obama made a historic visit to the country, which had spent decades as an isolated, North Korea-like pariah, in 2012. The country’s democratic progress has looked more questionable lately given widespread reports of violence against the country’s ethnic minority groups, particularly the Muslim Rohingya, who now form one of the world’s largest refugee populations. The Rohingya issue is likely to be a major test for the new government. While the NLD appears to have performed well in several minority-dominated regions, the Rohingya were largely disenfranchised under discriminatory voting laws. Suu Kyi has been criticized for not speaking out against the persecution of the group and the growing strain of virulent anti-Muslim Buddhist nationalism that is becoming a major force in the country’s politics. Suu Kyi may have more room to maneuver now that’s she’s won a mandate from voters, but this is not the only issue where she may fall short of the impossibly high expectations placed on her. The daughter of Burma’s founding father Gen. Aung San, “the Lady,” as she is widely known, grew into an icon during her years of imprisonment and her star power was a major factor in the vote. As an imprisoned dissident and then an opposition leader, Suu Kyi was viewed by her supporters in Myanmar and abroad as a saint. Now she’ll have to be a politician.